These untitled and undated drawings illustrate the effects on stability in what appears to be a Delaware (Battleship # 28) class battleship in the event of flooding forward from underwater damage. Two damage conditions are considered, one with flooding limited to beneath the protective deck, the other with flooding to the normal waterline. 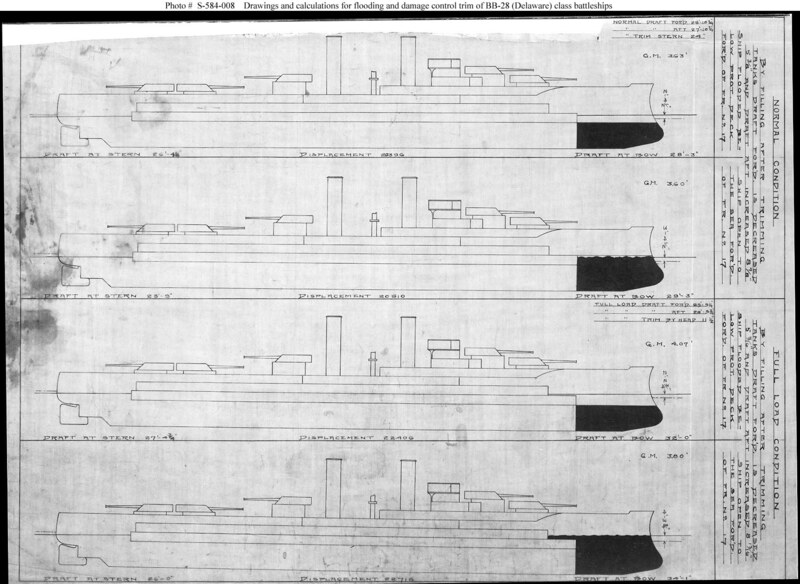 The drawings depict stability margins (in terms of metacentric height, or "GM", and flotation trim angle) for the ship following counterflooding of the after trimming tanks under two different initial conditions of load of consumable stores, normal and full load. This undated plan probably dates from about 1911. The U.S. Navy elected to eliminate armor at the extremities and upperworks in adopting an "all-or-nothing" protection concept in 1911. Investigations of damaged stability such as this were important in judging alternative concepts.